Hidden, the latest reincarnation of the Westin Grand's restaurant, is a concept that works in context: a hotel restaurant that offers its guests all the familiarity of comfort food, but with enough tweaks to remind you that you're not in Kansas anymore. Equipped with the Los Angeles Edition of Saveur courtesy of Joe, and a ton of Internet references including Jonathan Gold - Laweekly, (Pulitzer Prize winner and the man who wrote Nate Dogg's Eulogy), Chowhound, Grubstreet and various other references we set out to sample the best the city has to offer. The Chowhound forums with confirmation from the La Weekly directed us in our breakfast search to Square One for buttermilk pancakes which were extremely light and fluffy and also to Nickel Diner for some country biscuits and gravy. LA is about three hours north of Mexico and the large latin population is clearly evident when walking the streets which means there are going to be some fantastic food spots and trucks. We had our local Mexican friend take us to her family favourite spot in east LA. Mariachi bands welcomed you as you entered and one lady stood behind a booth making fresh corn tortillas using a wooden press. We ordered some flautas and a dish which was essentially a stone bowl sarlacc pit containing beef, chicken, cactus and cheese (Molcajete). Amazing, the fresh corn tortilla makes such a difference. 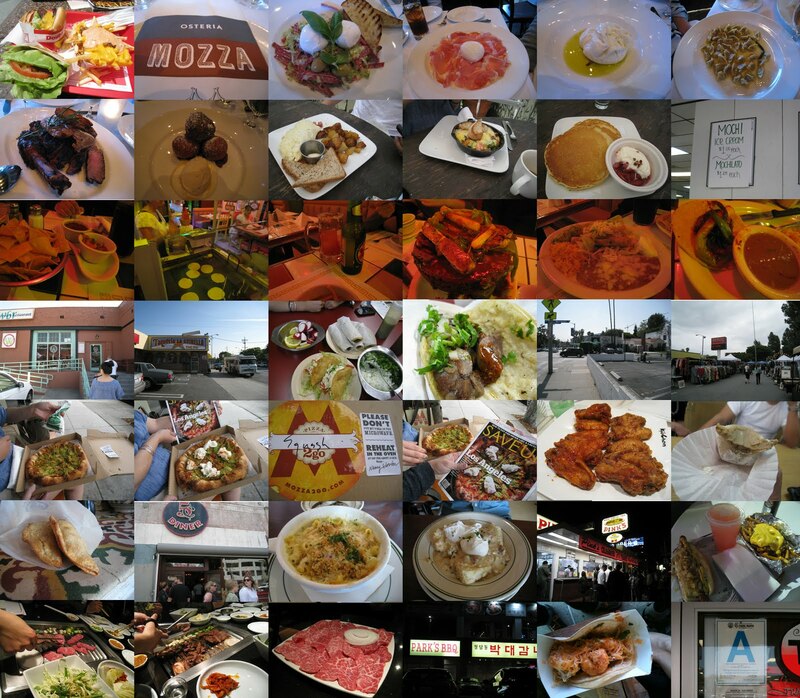 The next day we wanted more Mexican food so we used our GPS to get back into east La to eat at La Estrella taco shop. Inside we were the only non Mexican people and the staff didn't even speak English. We butchered some words and finally managed to order a couple of glasses of horchata, an assortment of tacos and some taco durados. All fantastic and cheap. They even had cow brain to eat but I had to pass and enjoyed the beef tongue. LA's Koreatown, is massive and vibrant. Here we ventured out and had some double fried chicken wings from Kyochon and some Korean BBQ at Parks. I smelled like Korean food but still ventured on for some comedy at Upright Citizens Brigade. The eating highlight of the trip was the stop at two sister restaurants, Osteria Mozza and Pizzeria Mozza, which are owned by Mario Batali, Nancy Silverton and Joseph Bastianich. At Osteria Mozza, I had to check my lactose in tolerance at the door and I went to town on some burata imported from Puglia, an amazing pasta and a porcini crusted 24 oz steak. The pasta had such an amazing complement of flavours and the crust on the steak was remarkable and put every steak I have previously had to shame. Loving our meal so much, we made sure we went back to try out the Pizzeria Mozza. We ordered the squash blossom pizza with burata ($23) which had an exceptional crust thanks to the recipe created by bread queen Nancy Silverton. I must say though that the sauce from Nicli Pizzeria in Vancouver may be more to my liking but the crust at Pizza Osteria was definitely the star of the show. We visited a few other spots like In N Out Burger, Mikawaya Mochi Ice Cream, Pinks for some chili cheese fries and a hot dog and Urth Cafe with hopes of seeing Vincent Chase or at least one of the broads from the show. Unfortunately, the kogi bbq taco truck and Langers escaped me (the traffic was too much). With all the cheap fares on Allegiant Airlines, and the ability to rent a car for ten dollars a day on Priceline.com, a quick trip to LA can really satisfy some of your food cravings for a reasonable price. WHO NEEDS THE SUSHI MART? I DO!!!! Determining a good sushi spot is generally really easy for me, it is fresh or its not. When I go to sushi spots I usually get a very basic assortment consisting of salmon sashimi, chopped scallop roll, negitoro roll, dynamite roll and sometimes some tuna sashimi. A cook is as only good as their ingredients and for something like salmon and tuna sashimi it really is just about that. From my conversations with sushi chefs there are some types of fish where there are specific ways and techniques to make your slice but for tuna and the most part salmon, there is no special technique. For these items it really comes down to the quality of their sourcing and the restaurants turnover. Restaurants that are not busy, have to be very careful with the quality of their fish because if it isn't under proper temperature control and/or if he has been sitting around for too long, there is a good chance that the fish should not be served. For downtown, there aren't many places that I can recommend that serve cheap, good sushi. There is Miko but that doesn't fall under the cheap category, the izakayas have all stepped up the quality of fish they serve but not a place you really go for just sushi, and the only other place I can think of is Yamato on Davie. Well now there is Sushi Mart on Denman. This place came highly recommended by my Japanese friend, and all I could do was doubt it because the name just screams bad sushi. Shipping skids hung along the wall give this place a very unique and creative interior and once inside the process is simple. You order at the counter, and they bring the sushi to your spot at the large table. The fish is great and cheap for a downtown spot. Salmon sashimi was fresh (4pcs - $5.50), and the albacore tuna ($5.00 for 4 pcs) was buttery with a clean smell. The dynamite roll ($4.50) was a little different than the norm, instead of the deep fried prawn, the roll was stuffed with tempura to give that extra crunch and it worked. The green salad ($3.75), negitoro ($2.50) and the chopped scallop roll ($3.50) were all fresh and tasty. Give this place a shot if you are looking for fresh sushi in the downtown area. Ed. - We're huge fans of Re Up BBQ, both for the great sandwiches they offer and because they're just really nice folks. We asked them for a behind-the-scenes account of what it's really like to operate a food cart: here you go. 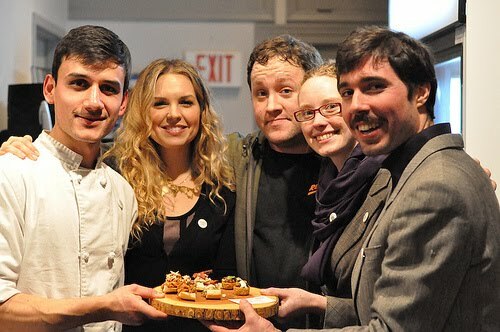 On August 9th 2010, five Vancouver kids became the proud, un-planned parents of a bouncing, baby mobile food cart. Michael Kaisaris, Lindsay Ferguson and Chester Carey, with three weeks to create and open the business, teamed up to serve authentic Southern BBQ at the Vancouver Art Gallery as part of the City of Vancouver’s street food pilot program. The Re-Up BBQ was born. 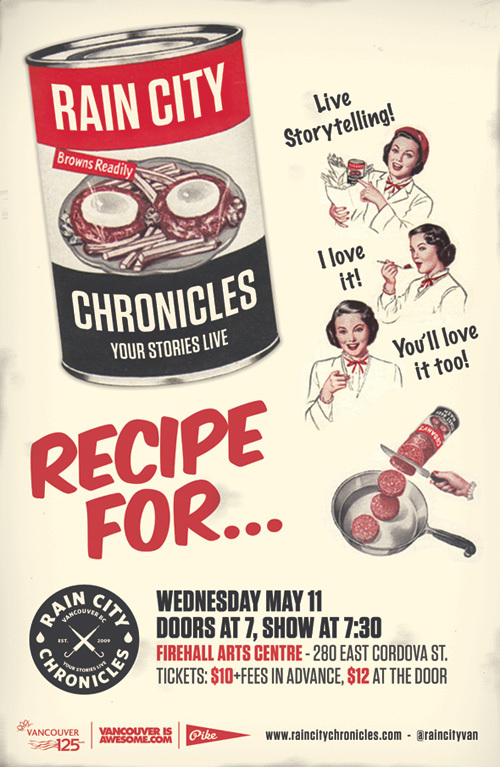 I 'm telling a story at the next Rain City Chronicles on Wednesday, May 11 at the Firehall Arts Centre. I promise you that I am a better at speaking than I am at writing. No guarantees though. 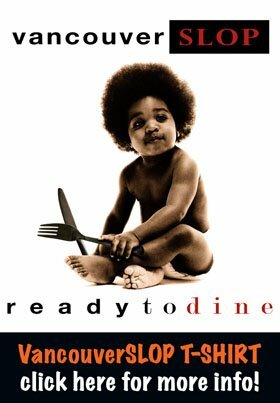 For some of you who watch the Food Network religiously, the name Maria Hines may ring a bell. She competed on Top Chef Masters and Iron Chef America where she went up against Iron Chef Morimoto and walked away with a win. Maria Hines has two restaurants in Seattle, Tilth and Golden Beetle. Tilth is located in the green house you see below in the photos and according to their website they want you to feel like you are are guest in their own house. The vibe is great. Busy, comfortable and fun. The food was also fantastic. The price point was closer to 15 to 25 a plate, but they would do half orders and customize the number of burgers for your table. The highlights for me were the mussels and the steak. The mussels came in an amazing broth rich with bacon flavour and made me think that all my previous meals of mussels were out of a can. The hanger steak was cooked perfectly and came with a sauce that just made the steak melt in your mouth. For a more detailed review you can see Joe's previous post here. Local cheese plate - incredible. My trips to Seattle have usually included a visit to Tavolata from Ethan Stowell. This time we decided to check out one of his other restaurants, How to Cook A Wolf. Again, we walked out of the restaurant super happy. The menu was reasonable in price with each dish costing from 10 to 15 dollars. Each dish was solid but tonight the trout stole the show. I usually don't love cooked fish but this one was cooked perfectly with an amazing flavour. The skin was amazing and really left that lasting impression. Unfortunately, I don't remember the details of each dish but I can remember that How To Cook A Wolf is a worthwhile stop if you are in Seattle. With the strong dollar and the variety of shopping (nevermind Trader Joes) it makes it worthwhile to take a trip down to Seattle. In my opinion the one thing that Seattle does a lot better than Vancouver is West Coast cuisine. With a little internet research, and some GPS programming, we were off. First brunch, Sitka and Spruce. First of all, this place is damn cute. Sitka and Spruce is co located amongst a few other food shops in a space that used to be an autobody shop. The autobody shop is now home to what appeared to be an amazing butcher, a cute flower shop, a bar/wine store and a coffee shop. Essentially a cute little market with amazing product. Sheep's milk feta with oliver oil, heirloom navels, fennel, honey, pistachio and dukkah ($8) - Incredible, and pretty simple. A great dish to try and recreate at home.